Whether you’re planning a trip out West or live locally in Utah, you’ll definitely want to plan at least one excursion to Provo. This city happens to be the third largest in Utah, so it’s no surprise that it always has something incredible happening in the community. No matter what your interests are, or which season of the year you visit, you’ll virtually always find a fun festival to attend with friends and family. Here are some of the best festivals to attend in Provo, Utah that you won’t want to miss. 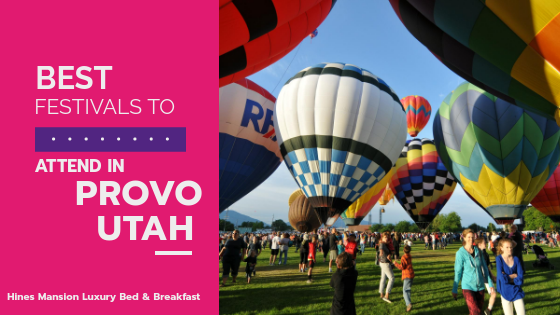 This breathtaking hot air balloon festival takes place every summer in Provo. 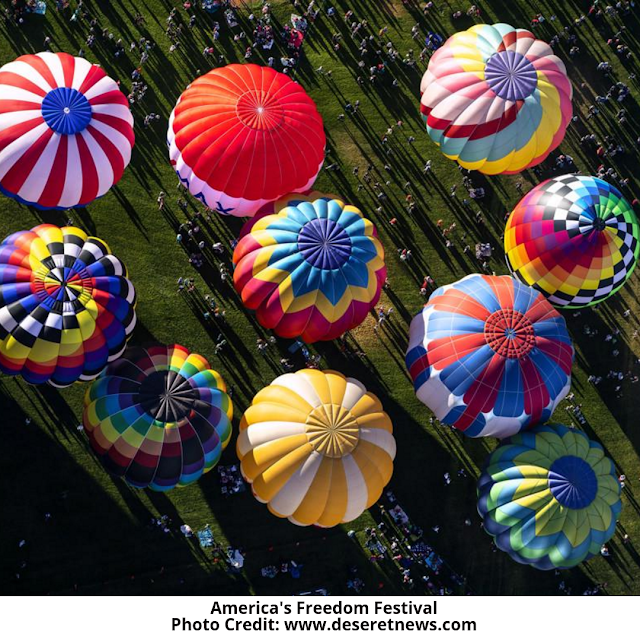 For the last 30-plus years, more than 25,000 intrigued spectators have gathered at this balloon festival to see the enormously powerful hot air balloons. Get there early to witness the 25 balloons be inflated and take on different shapes, sizes, and colors. Watch the highly anticipated Hare and Hound competition as professional pilots from around the country compete to pop large balloons from 200-300 feet in the air. On the final day, don’t miss the Freedom Festival Grand Parade, a large parade down University Avenue with ornate floats, musical performances, and giant balloons. Another summer celebration, Pioneer Day Extravaganza, takes place every year on July 24th at Provo’s North Park. This celebration is in honor of the day in 1847 when Brigham Young led Mormon pioneers into Salt Lake Valley. This day allows the community to go back in time and enjoy some traditional pioneer activities such as a pie cook-off, panning for gold, and a duck hunt. 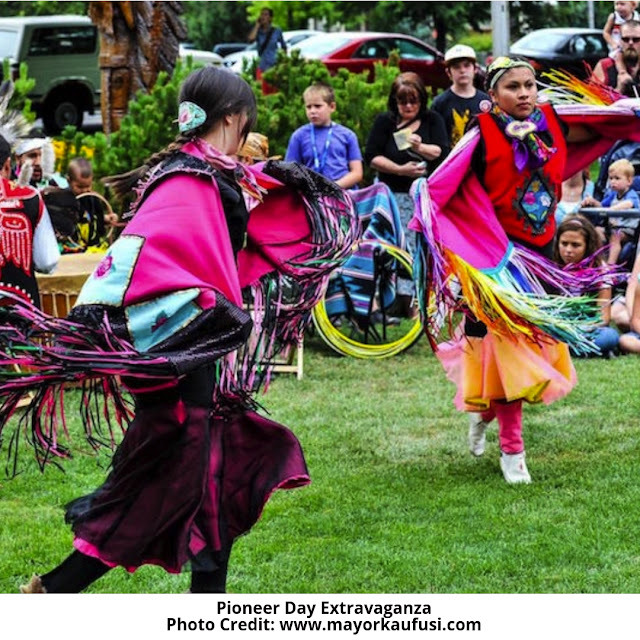 This is a perfect festival to bring the whole family to, as they’ll love listening to the live folk music, playing the pioneer games, getting their faces painted, taking pony or covered wagon rides and eating all the delicious food from various local food trucks. 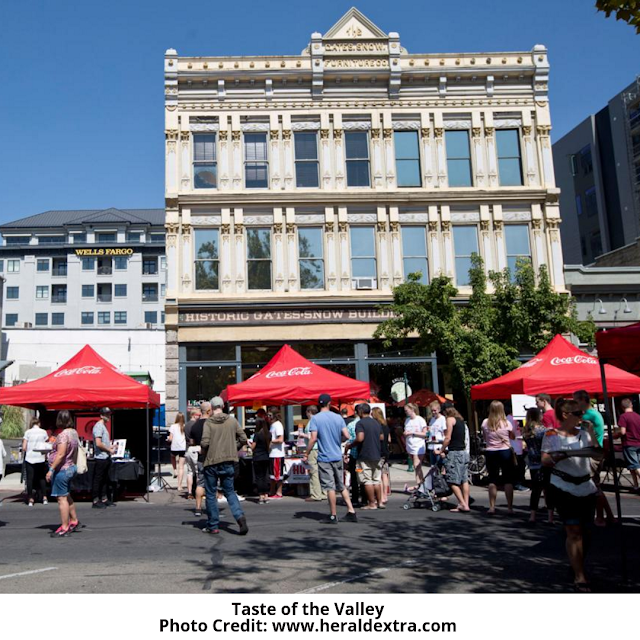 Also in celebration of Pioneer Day, Taste of the Valley is a separate food tasting of some of Provo’s best eateries. Each year about 25 local restaurant establishments gather to give the community a taste of Provo’s most delicious flavors. Throughout the day, attendees can explore the different booths, eating their way through the festival, literally. Typically, the chefs will serve up tastes of their most iconic or popular appetizers to attendees’ stomachs delights. Make sure you come hungry! The Provo Rooftop Concert Series is a summer music event that will have you dancing in the streets. This festival, which was started by four Provo natives in 2010, was meant to encourage locals and travelers to listen to one of Provo’s favorite pastimes while enjoying the beautiful downtown area. Though it started on a rooftop, the series became so widely attended that it now is held in the streets of Downtown Provo. Whether on the ground or in the sky, attendees will appreciate the fantastic music line up and celebrate the beauty of Provo just as much. Each year during Labor Day weekend, the Centro Hispano organization, which has been supporting the Hispanic community in the area for more than a decade, organizes a weekend-long Festival Latinoamericano. The celebration takes place at the Utah County Historic Courthouse. Throughout the weekend, from afternoon until late evening, there is a diverse array of events from various Latin American cultures. The inaugural festival began in 2001 and has continued to be a staple in the Provo community. Attendees will enjoy hours of entertainment from live musical performances and vibrant culture-specific dances with delicious well-rounded cuisine to keep them going. Sponsored and organized annually each fall by the Provo Pride Council, this festival is an incredibly fun, day-long event also at Provo’s Historic Utah County Courthouse. The event draws in thousands of attendees in support of the LGBTQ+ community in Provo and throughout the state. With more than 50 vendors, tons of entertainment and great food, you’ll love being a part of this celebration of diversity and inclusion. Just a short drive away from Provo is Lehi, Utah, where the annual Timpanogos Storytelling Festival takes place. Not only is this festival popular throughout the state, but it is actually widely known throughout the United States and Canada. Storytellers and attendees alike will travel from all over to experience the fall storytelling festivities. Over 25,000 listeners attend each year for the two-day story celebration. Both daytime and nighttime storytelling events are available, but be sure to plan in advance as many of them will sell out. This is a fabulous Christmas holiday extravaganza you and your loved ones must witness. Hop in your car with as many family or friends as you can (legally) fit and drive through a beautiful light spectacular synchronized perfectly to holiday music. There is a flat entrance fee charged by car, so the more you can bring with you, the better. See a plethora of snowmen, reindeer, huge candy canes and amazing Christmas trees - it’s a real-life Winter Wonderland right before your eyes. Christmas in Color is certainly a festival you’ll want to continue visiting year after year, turning it into one of your Christmas traditions! This amazingly diverse and entertaining group of festivals is just one of the unique things that make Provo, Utah such an incredible city to visit. Each one is completely distinctive, providing fun and excitement for all attendees. If you’re looking to learn new music genres and artists, then the Festival Latinoamericano or Rooftop Concert Series is perfect for you. Seeking an educational experience? 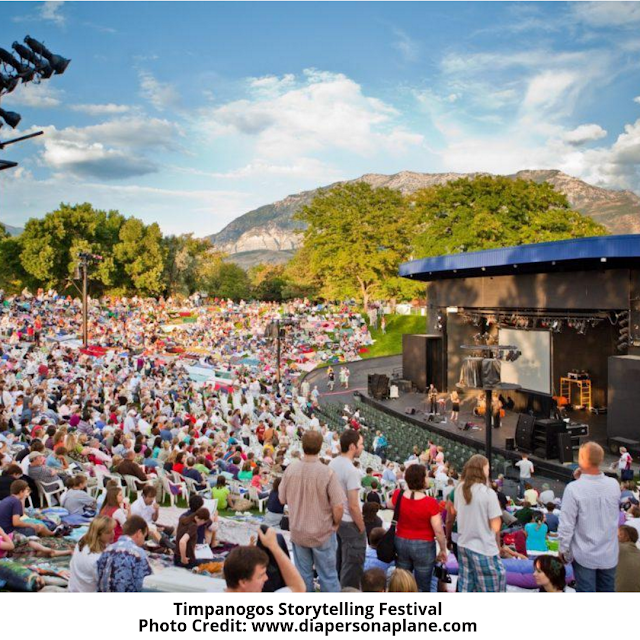 Head to the Timpanogos Storytelling Festival or Pioneer Day Extravaganza. To support diversity and the local community, don’t miss the Provo Pride Festival and Festival Latinoamericano. And last, but certainly not least, for an all-around fun and vibrant festivity, then Christmas in Color and America’s Freedom Festival at Provo should absolutely become annual traditions. Whether you’re traveling to Provo from nearby or far away, these events are sure to provide a lifetime of memories with your friends, family and loved ones. Fall is upon us! What are you planning for your Halloween fun? Do you need an excursion? Yes! What's your Halloween destination this fall? Your family needs a Halloween excursion that doesn’t feature not only spooky, scary, or gory but also a nightmare-inducing Halloween experience. This fall, don't just pick a regular destination, choose one to remember for its super fun family Halloween activities! 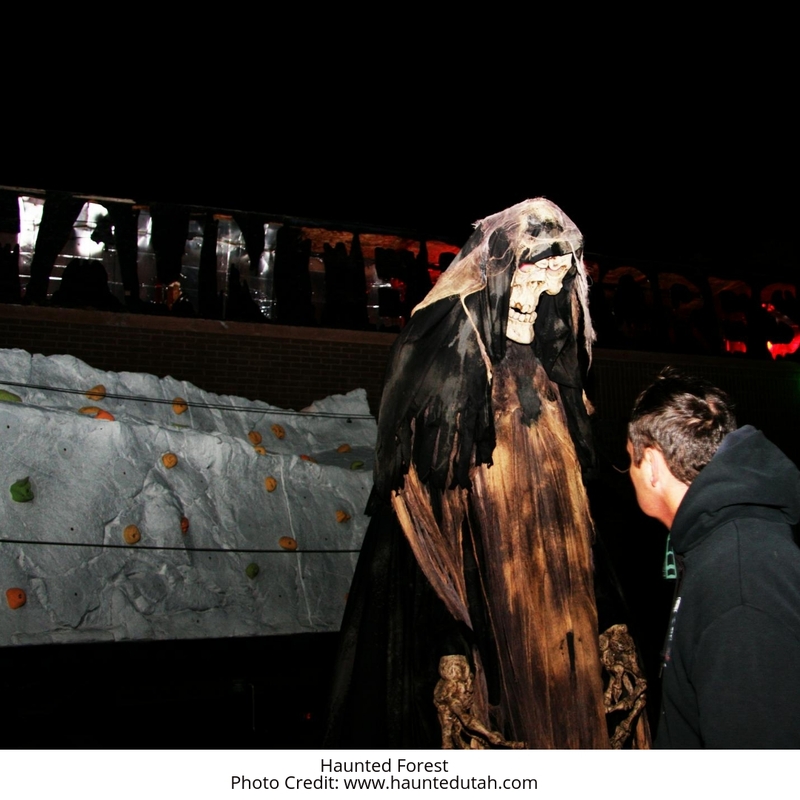 Visit and enjoy a once in a lifetime Halloween experience in Provo, Utah. 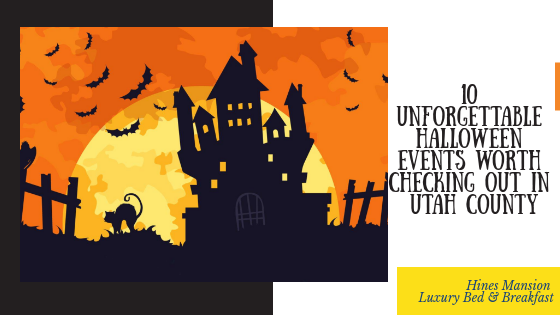 Check out all the fantastic family Halloween activities in Provo this year! Provo, Utah is a fantastic destination for your family Halloween to make new memories this season. The city has an abundance of Halloween activities for the entire family. 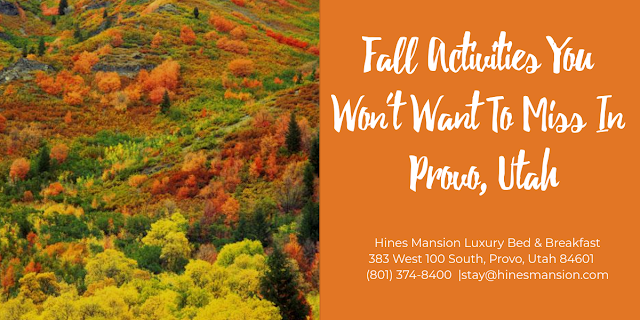 As you look forward to the cooler Utah weather and magnificent changing leaves to the stunning historic Hines Mansion, it’s time to start preparing your family for an adventure. It doesn't matter if you haven't been to Provo before, every Halloween is spectacular and unique in its own way. Your family will enjoy meeting a friendly ghost, scream and play along Provo streets while enjoying the yummy sweet treats the city is offering. Provo weather is crisp. You will be enjoying the gorgeous multi-colored leaves as they crunch under your feet. Everything in Provo is pumpkin spice, apples, and the celebration of the harvest gives that good smell. As you walk along the Lake admiring the surrounding mountain scenery, the fall season is a treat for your senses. By now you will have noticed that Halloween is a serious business in Provo, Utah. The city is beautified with golden, amber, and scarlet hues, welcoming its fall action, spooky goblins, opening Count Dracula’s dark, ancient cave and the shores of the water’s edge for singing Pirates. Wow! Just one of the must-visit Halloween-themed attractions in Provo, UT. Lagoon features dark side terror with seven different Halloween-themed attractions and a park. Lagoon Frightmares is filled with screaming fun, attractions such as rides, events and shows, an assortment of food vendors sprinkled about to make your fall holiday a lifetime experience. Don’t leave the Lagoon Frightmares until you ride the Cannibal roller coaster - the tower of a coaster with speeds of 70mph throwing you into a 116-degree drive. Don’t forget Dracula’s castle where you can grasp the frightening dark cave setting with surprises around every corner. For those looking for some Halloween action, dare to enter the scariest haunted house in Provo. The Strangling Brothers are famously known for their most frightening circus where the freaks come out when lights go out. 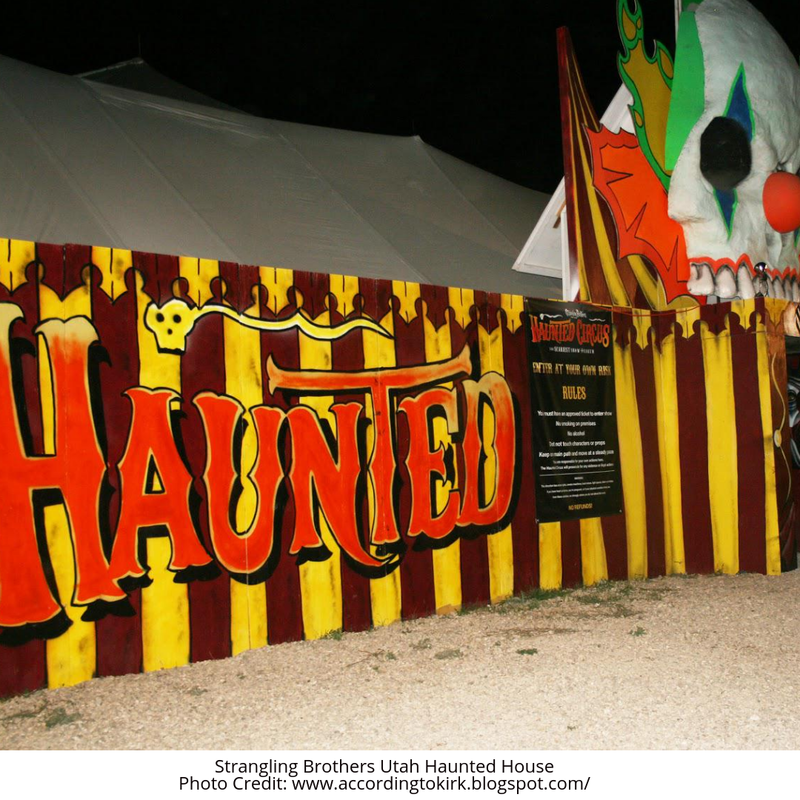 Strangling Brothers features three equally terrifying attractions: the Haunted Circus, the Zombie Hunt paintball game, and the scary Escape room. The Strangling Brothers story dates back to the 1900's best known for its shadowy circus that travels across the landscape, preying on its victims who can’t help but scream as they run. The ringmaster is on a quest to recruit new members, focusing on outcasts, freaks, and orphans, they all come together in this scary world. 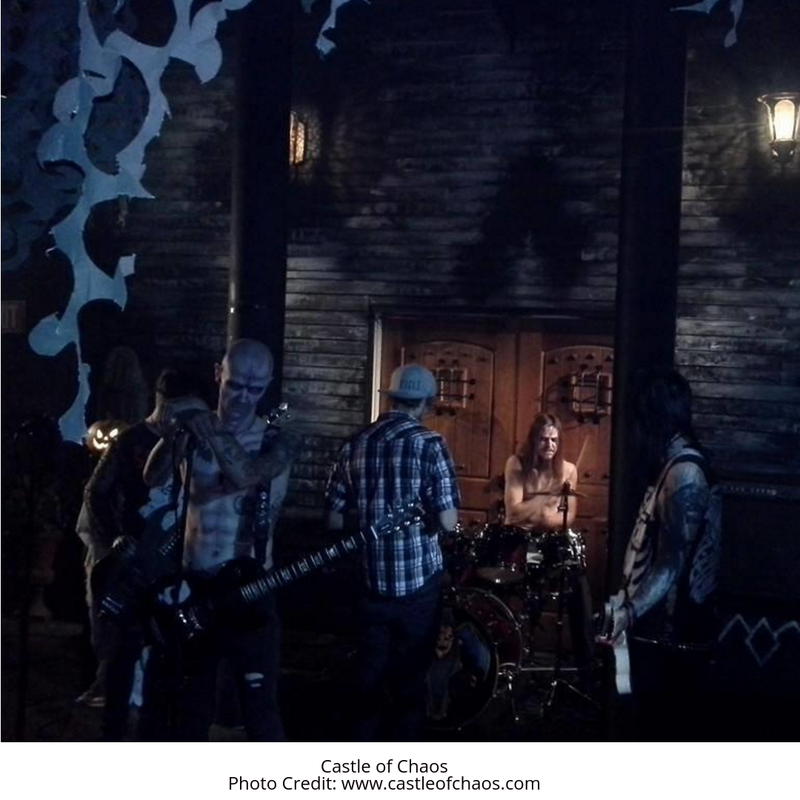 Named one of the best haunted attractions in Utah, every year the castle gets an update with new scares, longer tours, and high-quality sets. It’s filled with scary monsters and hidden dark spots; you’ll run to the end. A visit to the Castle of Chaos leaves a lasting impression. This free adventure is lots of fun for the whole family. You will enjoy seeing funny witches all over the shops. 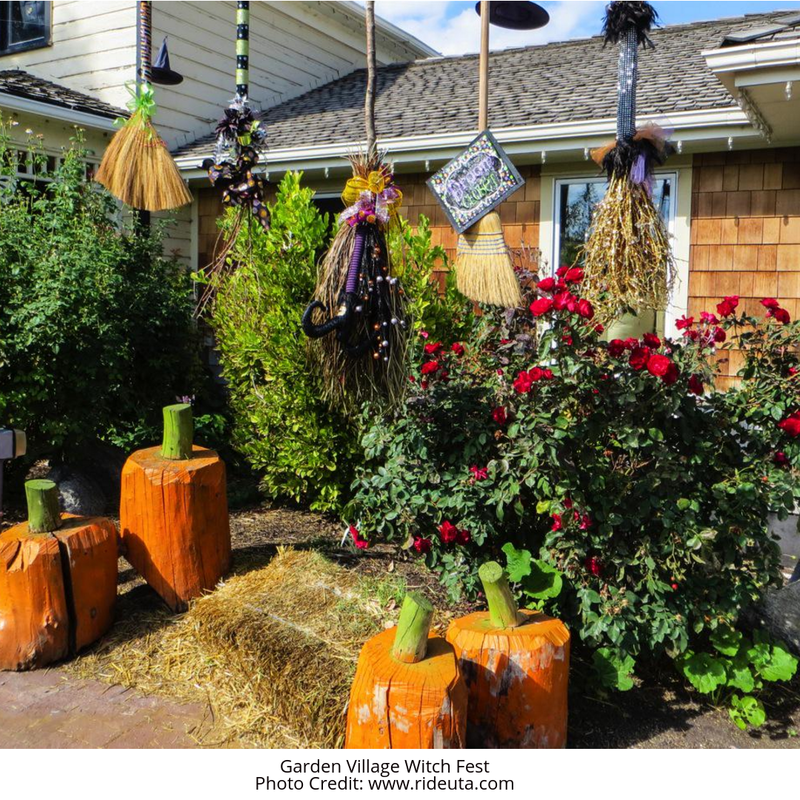 Gardner Village WitchFest has a “Six Hags” Witch Adventure, a 5K witch run, Witches Night Out, and a witch display. Your kids will enjoy the Gardner Village scavenger hunt that involves finding various witches across the Village from September 15 to October 31, and later, check back in for a discounted treat at the bakery. The family can shop around, enjoy the various local foods, spend time at the pony and petting zoos, or even take sewing and knitting classes. The holiday can’t be better with fall spicing stores, colors, and themes bringing kids and parents comfort. In Salt Lake City, the Fear Factory bus will bring you directly into the factory. People believe it’s a haunted place as Fear Factory began as an old cement warehouse where workers were killed in a freak accident. Ziplining, the breathtaking “Fear Fall”, and Virtual Reality bring you literally into a world of fear. With Halloween-themed riverboats, this family ride is a 20-25 minute adventure floating down the Provo River. Singing pirates stand by along with 100 hand-carved Jack-o-Lanterns. Enjoy themes of “The Headless Horseman” or “The Cremation of Sam McGee” - come along mateys! Famously known as the Pumpkin Train, is a milder Halloween attraction. It’s a 90-minute train ride featuring seasonal sing-a-longs and costumed characters. With every trip, you get to take home a pumpkin and pumpkin cookies. The community around Provo has been holding on to the precious historical railroad proudly since the 1800's. It will be a memorable train ride in an antique caboose and a coal-heated coach. Opening every year on September 16th, the Haunted Forest is known to scare the pants off of people. The forest fright has been running for over 25 years so they know what they're doing! By the end of the Haunted Forest, you will be shrieking and running for your life. The forest is set to bring fear and gruesome creatures you’ll never find anywhere else. From October 20 to 31, you can enjoy miles and miles of stunning views as your family rides the Sundance Halloween Ski Lift. The mountain resort also offers zip lining through treetops, gliding from one tree to another and with a camera, you can capture every moment. Later in the day, the whole family can enjoy bike riding up and down the hills. When you are all tired, come down to the river for a relaxing and calm environment where you can enjoy fly fishing and art classes. 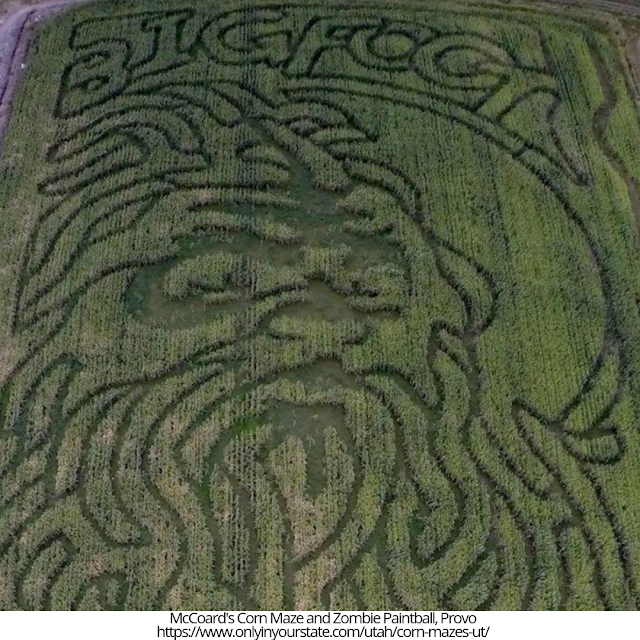 This year, the Provo corn maze has been designed after Bigfoot. There is also a u-pick pumpkin patch, featuring a new Halloween-themed zipline and zombie paintball. Later you can enjoy the hayride, and zipline over the autumn patch. Let your family play various monster farm games and be sure to get your family picture at the photo-op later. Your family will love the McCoard’s Mystery Maze, with two styles of mazes. One of a kind for kiddos and those looking for adventures. This skims the top of all the available Halloween events around the Provo area but hopefully, it will give you a good start. Have fun celebrating this fantastic season with the people you love! Though there are many incredibly intriguing cities to visit in the state of Utah, Provo is one you definitely must spend time in. It has consistently been considered one of the most desirable places to live for a number of reasons including its metropolitan size, proximity to beautiful nature, and tight-knit community. But besides these reasons, there are more little-known facts that make this city truly shine. Here are eight fun facts you may not know about Provo, Utah. Originally called Timpanogots after the Timpanogos Tribe that was native to the area, Provo became Utah County’s first city in 1849. Incorporated more than 160 years ago, this city solidified its place and importance in the State very early on. Situated within the picturesque Utah Valley at an elevation of more than 4,500 feet, Provo was a beautiful area for its first and very notable city. In Provo, the first school house was built right away in 1850 and in 1872, the highly anticipated railroad reached the city, spurring immense growth. It stood alone as the only city in Utah County for three years until Lehi became its second incorporated city. Waves of Mormon settlers landed in Provo in the late 1840’s, making it their first settlement outside of Salt Lake. Upon their arrival, early conflicts with the Native Americans ensued, leading to what is known as the Provo War. Those Mormon’s immediately began establishing the community, and pieces of the centuries-old traditions that started in Provo are still felt throughout the city today. The story of how cities get their names is always an intriguing one, with this one being no different. Provo was named after a French-Canadian trapper named Etienne Provost. Born in 1785, Mr. Provost was also referred to as the “man of the mountains,” due to his strength and knowledge in the wilderness. Both the Provo River and the City of Provo were subsequently named after him. Provo holds the title as the largest city in Utah County and the third-largest in the entire state. The population is estimated to be close to 117,000 according to the most recent census. The second-largest city in Utah is the West Valley City and Salt Lake City takes the cake as number one. Just like it’s size, the available activities, entertainment and dining options in Provo feel virtually endless. There are actually more than 100 restaurants in the city. In addition to its population prominence, Provo also holds another distinction in terms of its physical land size. The city stretches over a 41 square mile area, covering an incredible amount of beauty within. From a charming downtown area to breathtaking landscapes for hiking and camping, the vast size of Provo makes it well-rounded and expansive. Spend a day learning history and culture at one of the city’s fascinating museums or take in live performances at one of the local music or theatre venues. Provo is also home to the expansive 500-plus acre Brigham Young University, known for its academics, sports teams, and variety of extracurricular activities. More than 30,000 undergraduate students attend this iconic university in Provo. 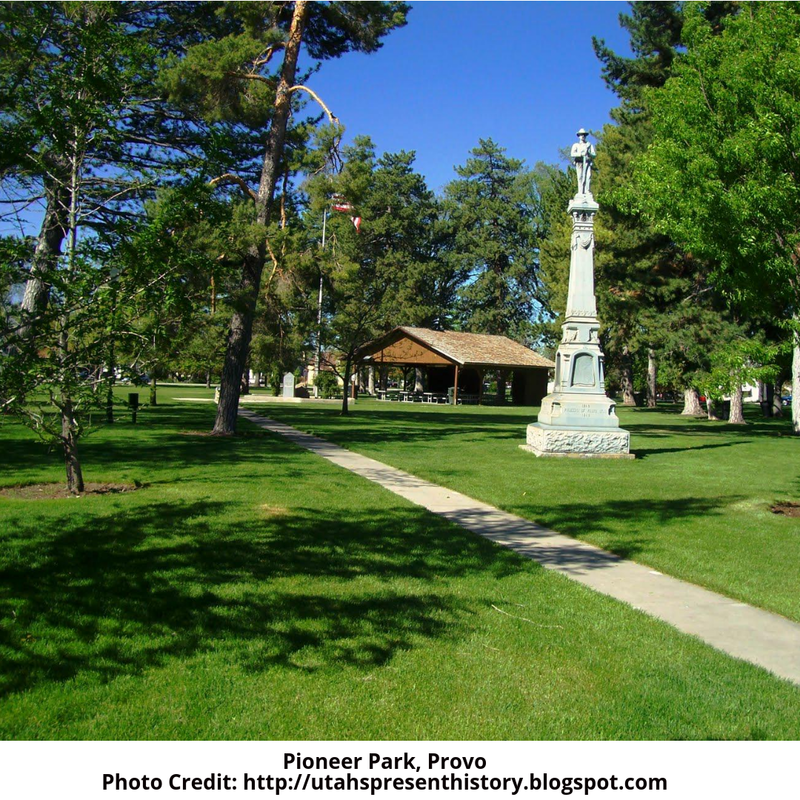 Within the expansive city limits of Provo is an outstanding system of city parks. There are 27 parks spread throughout the area with more than 800 developed acres of park land and 35 miles of paved pathways. Back in the day, the city was even once nicknamed The Garden City due to its massive number of orchards and gardens. Provo’s Parks and Recreation department has actually been nationally recognized and the city was honored as the second best for outdoor recreation by Outside Magazine. At many of the parks, visitors will be able to enjoy hiking, bicycle riding, playgrounds, outdoor BBQ’s, dog runs, volleyball, tennis courts, and much more. Just a few of the picture-perfect parks you’ll want to spend time in are North Park, Pioneer Park, Canyon Glen Park, and Bicentennial Park. More than 20 percent of the population in Provo is under 18 years old, making it one of the youngest populations in Utah County. A large percentage of the youngsters living in Provo can be attributed to the vast number of students living there while attending BYU. Approximately 8 percent of the population is under 5, due to its incredible family-oriented nature. Overall, the city has the sixth-youngest population and is certainly proud of that. With so many beautiful parks, a bustling downtown district, its growing restaurant and nightlife scene, and many historic museums, it’s no wonder Provo has been named one of the most attractive places to live. In addition to all the awesome facts about this Utah City, it’s also making waves as the ideal place for large businesses to set up shop. As you explore Center Street in Provo, you’ll see a number of businesses, including many well-known ones, lining the street. In addition to all those living in Provo, there are actually close to 9,000 various businesses that also call the city their home base. Perhaps most notably, Provo houses Qualtrics, NuSkin, Ancestry.com, and Vivint to name just a few of the most recognizable ones. 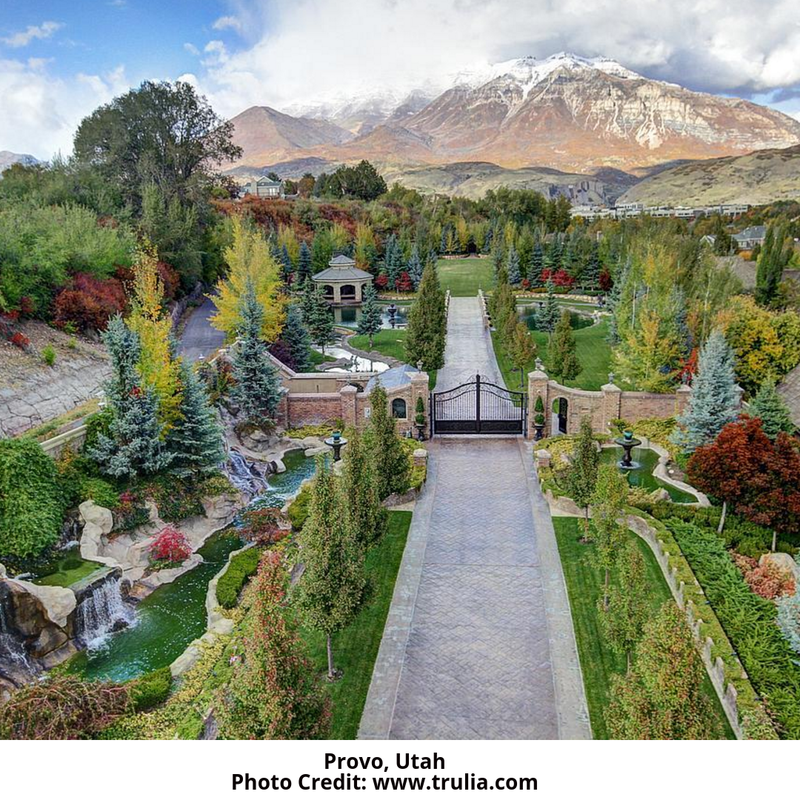 Besides well-known companies, there are also a number of famous individuals who have had homes in Provo. Singers Bert McCracken, Tyler Glenn, Donny and Marie Osmond, Author Steven Covey and Boxer Jack Dempsey are just some of the stars to have graced Provo with their presence. Provo, Utah is an extremely well-rounded and multi-faceted city. It is Utah County’s oldest city, named after fur trapper Etienne Provost, and one of its largest and youngest-populated cities. There are a number of well-known businesses that call Provo home, with its 27 beautiful city parks. 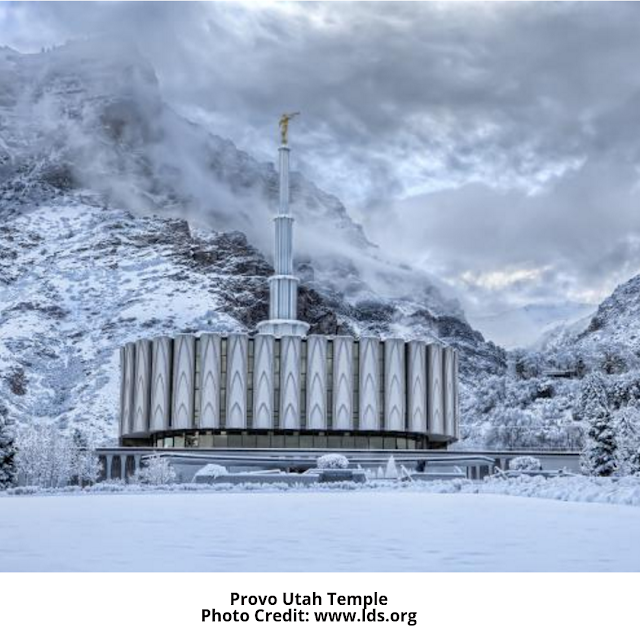 With its history dating back to the 1800’s as the first Mormon settlement outside Utah and a strong pull as one of the most desirable places to live, Provo truly has made a name for itself with country-wide prominence. 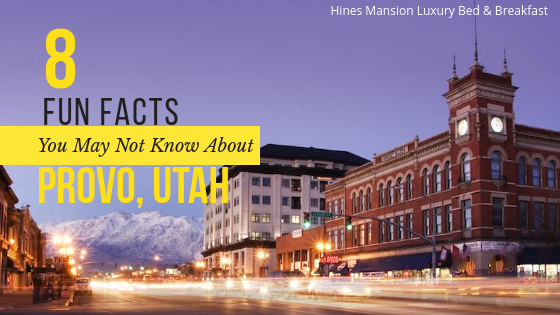 These fun facts are what make Provo a truly special place. Now that summer is officially coming to a close, it’s time to welcome in a new season filled with changing leaves, pumpkin flavors and beautiful, crisp weather. 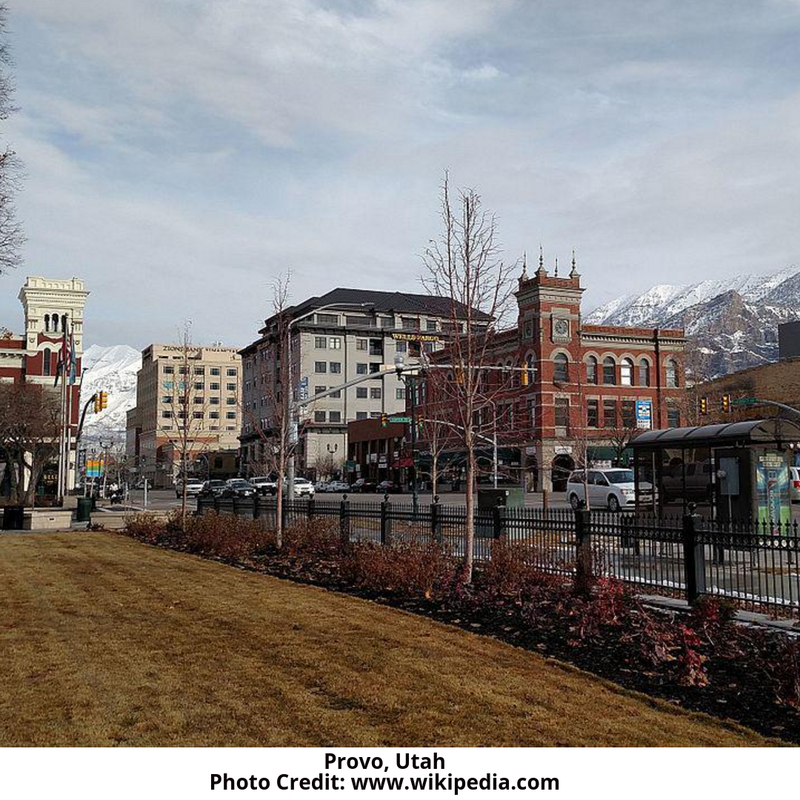 Provo is the third largest city in Utah, situated in the Utah Valley just over 40 miles south of Salt Lake City. 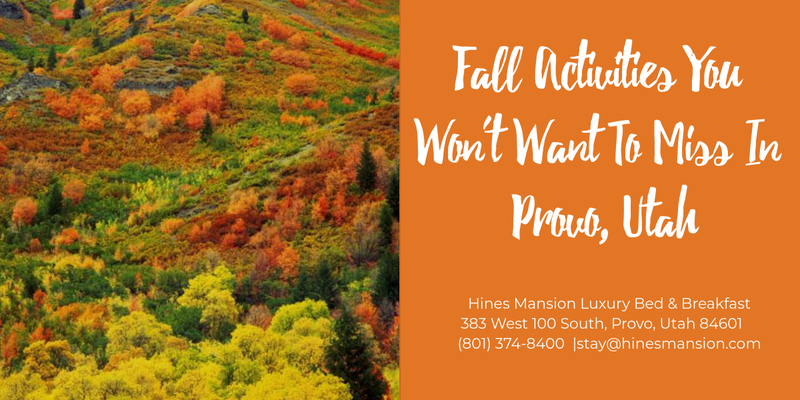 In many cities, but especially in Provo, this season is a special time filled with lots of fall activities you won’t want to miss. Check out the list below for everything you’ll want to see and do. During the fall season, corn isn’t merely a sweet treat to be eaten as a side dish or displayed as a seasonal decoration. In Provo, and throughout Utah, winding your way through a corn maze is an exciting and challenging fall activity that visitors and locals alike look forward to all year. Incredibly designed mazes or paths are cut through large fields of corn, allowing guests to venture along them guided by either instinct or a map. Bring your group of friends or family and see who can make it out first! Step aboard a large riverboat, and sail along the incredibly scenic Provo River for an entertaining Halloween Cruise. Be sure to keep your eyes peeled to the shore as you chug along. You’ll be passing more than 100 hand-carved jack-o-lanterns and their glowing spooky reflections on the water. Listen to your captain as he bids you ahoy and shares Halloween classics like The Headless Horseman as you chug along. Fall is one of the most celebrated seasons in Utah, and that means plenty of festivals and activities to ring in this crisp, beautiful time of the year. Throughout the state, there are a plethora of festivals and events you’ll want to attend, so be sure to plan accordingly. The Autumn Aloft Hot Air Balloon Festival, Oktoberfest, and Harvest Festivals are just a few of these can’t-miss events you’ll only find during the fall. Did you know that there are more than 20 different varieties of pumpkins? Whether you’re looking for a pumpkin to decorate, carve or cook, pumpkin picking is a fun fall activity for all ages. Head to the pumpkin patch and hop on a hayride or explore the rows of golden-orange pumpkins just waiting to be brought home. There’s nothing better than a delicious pumpkin pie or toasted pumpkin seeds to be shared with your house guests. Most have mini pumpkins as well for your little ones, which are the perfect size for fall arts and crafts projects. 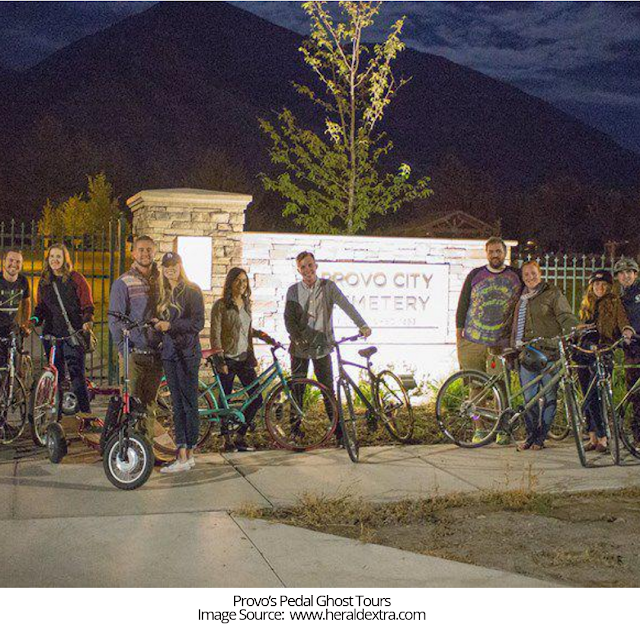 Grab your family or a group of friends and hop on one of Provo’s Pedal Ghost Tours. These tours are led by professional tour guides who are all Utah natives and experts in storytelling and the paranormal. Jump on a bike and take a guided tour stopping at various haunted and historic spots throughout the city. Typically, the tours will have 12 riders max, so keep this in mind if planning on attending a tour with a group. Choose from the Cemetery and City Edition or River Trail Edition, each marked by different spooky spots and corresponding stories. As fall begins to cool things down, the perfect place to warm up is Good Move Café. Open late night for after-dinner entertainment, Good Move Café is a Provo favorite. This café has lots of options for delicious food and old-fashioned sodas like Cowboy Cream Soda, Outlaw Orange Cream, High Mountain Huckleberry and Cherokee Cherry Vanilla. The best part about Good Move Café isn’t even the cuisine, however, it’s all the good moves you’re going to make while playing one of their 900-plus games. From traditional board games like Speed and Risk to lengthy competitions like Settlers of Catan, Taboo, and Reverse Charades, Good Move Café is the best place to spend a cool fall evening with friends and family. Layer up and head outside for an incredible hike this fall. As the leaves begin to change colors, the foliage on the trails is absolutely breathtaking. Whether you’re looking to take an easier hike or a more strenuous one, there are plenty of options in Provo and the surrounding area. For easily conquerable trails, try out Devils Kitchen or one of the Falls like Battle Creek or Timpanogos Falls. For a middle-of-the-road hike, head to the Y Trail on Y Mountain, known for its steep incline and incredible views from the top. Provo Peak is a very difficult and lightly traveled trail, only recommended for the very experienced. As the weather begins to cool off, there’s no shortage of museums to be explored. 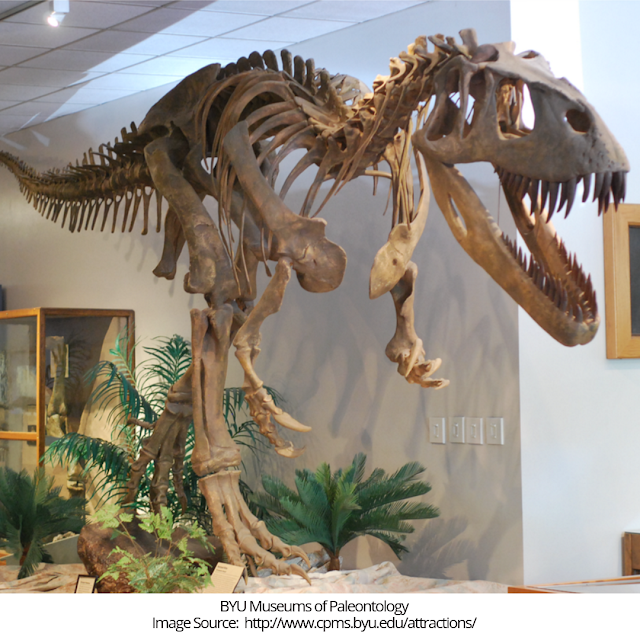 Some of the must-sees are the BYU Museums of Paleontology, Art, Planetarium, Life Science Museum and Museum of Peoples and Cultures. On a brisk day, your family will love learning and exploring one of these spectacular museums filled with interesting exhibits and artifacts. If you’re looking for some fall entertainment, you’ll want to stop by Velour for the incredible live music of all genres. Named as one of the best-kept secrets in Utah, this Provo venue has featured artists like Imagine Dragons, Sara Bareilles, Neon Trees, Local Natives, and many more. The fall season brings a number of performances, so be sure to check out their calendar so you don’t miss out. One of fall’s most popular pastimes is none other than football. In Provo, there is no shortage of thrilling games with BYU's Cougars. Head to the more than 60,000-seat LaVell Edwards Stadium and experience the electrifying Cougar energy first-hand. Fall is one of the most beautiful and exciting seasons of the year. 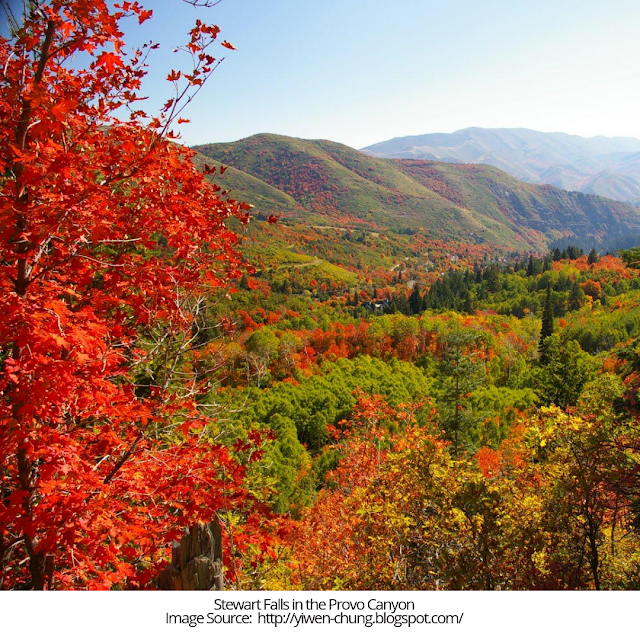 In Provo, there are a wide variety of incredible fall activities you won’t want to miss. Be sure to plan accordingly so you can take full advantage of the season and all this area has to offer.